The morgue shot avoids for an agonizingly long time the expected trope of the sheeted body that suddenly twitches, moves, or sits bolt upright. The camera holds still so long that we finally decide Lowery isn’t going to do that, he’s up to something else. And then, of course, he surprises us by delivering the trope after all—but only after it’s been drained of all sense of cliché. It’s eerily reminiscent of the unforgettable nurses’ station shot in William Peter Blatty’s Exorcist III—sheet and all. 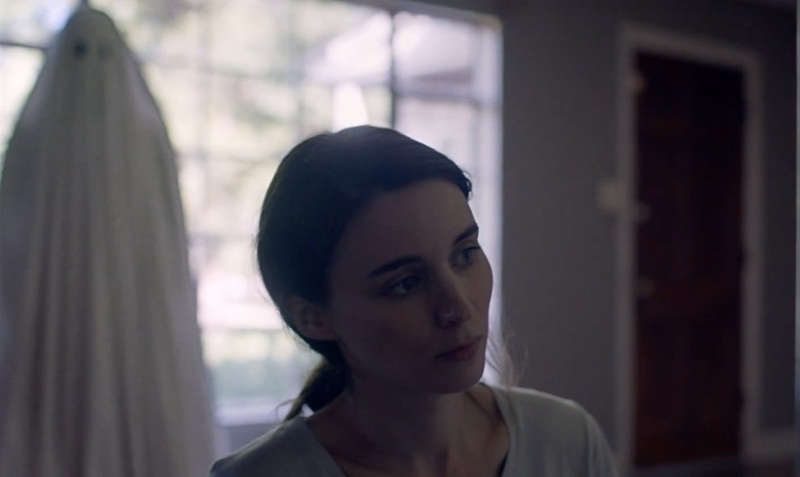 And then there’s the pie scene: We are still thinking of the film as charting the phases of grief, and we anticipate the reaction of M (Rooney Mara) to the pie dropped off by her friendly real estate agent. Which grief cliché will it be? Will she reject the pie and drop it into the trashcan? Will she leave it sit? Will she sample it and suddenly vomit? She sits on the floor, back against the wall, and eats piece by piece an astonishing amount of the pie, watched by the ghost of her husband C (Casey Affleck), by Lowery’s unmoving camera, and by our imprisoned eyes. Only once we’ve become drenched in the possibilities does she rise quickly and rush to the deep-frame bathroom. But by now we no longer know whether she vomits from grief, or remorse, or some unnamed other emotion, or simply from too much pie. Speaking of clichés subverted and refreshed, when was the last time you saw a ghost depicted as an embodied winding-sheet with holes for eyes? I know. Last Halloween. The idea is so old that it’s not even a cliché anymore, but it’s still the way a child sees and thinks of a ghost. And the way a lot of us former children do too. 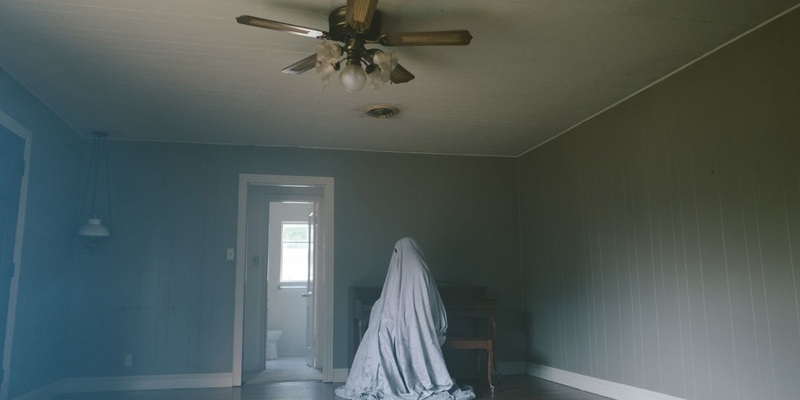 Throughout the film, prismatic refractions float against walls and curtains, or in free space, like lost unsheeted spirits; but for the Ghost of C, Lowery insists on the sheet. It’s a daring, goofy gesture whose sheer absurdity endows it with new grace and meaning. Time passes. M leaves for work on three different mornings in the space of a few seconds of screen time. This is what time must be like for a ghost—or at least for this ghost, for we always feel that the Ghost of C is something special, different from other ghosts. Just as in life, M wanted to move and C wanted to stay in the house, after his death M does move out and C’s Ghost stays. So does the piano—the piano that’s “always been here,” and they are welcome to take it with them or not. C is tied to the piano. It harbors not only C’s experimental compositions but Beethoven’s immortal “Ode to Joy”—another cliché both avoided and embraced, that tune becomes a piano lesson for a little girl, an apt example of art for the explainer identified in the credits as “The Prognosticator” (Will Oldham), and an occasional echo for C’s Ghost and our ears. M moves out and a single mom moves in with her two kids. C’s Ghost can’t resist the temptation to be the boogeyman in the closet and the poltergeist in the kitchen, playing at being a ghost and finding that the simplest childhood fears and games can be true. The Ghost is a child at heart. “I’m not growing up” writes the autobiographical child-diarist in Lowery’s A Delination (2005). Last year Lowery made Pete’s Dragon, and IMDb lists Peter Pan as an upcoming project. The mom and kids move out, and others move in. The Ghost of C remains, an unseen, unheard witness to vaguely definable things as they are, caught between what they have been and what they may be, like the wood, insects, and relationships of Lowery’s A Catalog of Anticipations (2008). I’m reminded of Some Analog Lines (2006), the first Lowery film I saw, a testament and a benchmark of things to come whose imagery includes wood-working, model-making, processes of making, acts of becoming—and sheets. There’s a party in which The Prognosticator tries to explain things. Will Oldham has a long monologue that recalls his epic biography-of-America bedtime story in Lowery’s short Pioneer (2011). And then an empty house, echoing the abandoned houses that become refuges for the runaway children of St. Nick (2009), and for the young, doomed lovers (also Affleck and Mara) in Ain’t Them Bodies Saints (2013). In the world of Lowery’s Malickian sense of nature, people in fields of grass, the grain of wood, the empty house becomes both construction and deterioration, another of Lowery’s half-hidden messages and half-buried bodies. The Ghost of C digs out the note he saw M wedge into a crack in the woodwork but as he opens it to see what it says, wrecking machines chew into the house with a crash. The house is a fixed place with a history—and then is only a space with a history, a house neither before nor after. So perhaps the ghost is fixed in time after all, a denizen not only of this space but of this particular house, this haunted house, and its little lifetime. The house next door goes down as well. The neighborhood becomes a high rise that engenders a cluster of office buildings. Finding itself on the top floor of the skyscraper, the Ghost takes a nose-dive back to the ground floor, triggering the brief frontier sequence, the end as beginning, the beginning as end. At the center of the film The Prognosticator explains it all for us, and would strike us as a pompous windbag, were it not for the fact that he is so visibly and deeply tortured by the Big Ideas he shares. Like an anti-comic Alvy Singer, depressed over the inevitable expansion of the universe, only a few billion years away, he ticks off all the things we think we have—love, art, God, progeny, memory—leaving us with only the emptiness of brutal impermanence. Years come and go, occupants of the house move in and move out; the ghosts and the piano remain. And when the wrecking crew comes to tear the houses down, leaving ghosts and piano in a sea of rubble, the ghost in the flowered sheet says, “I don’t think they’re coming” and, all sense of expectation and destination gone, collapses into an empty sheet, no longer an entity at all. Perhaps the possibility that something or someone may be coming is what keeps us conscious, keeps us whole, keeps us human; one thing The Prognosticator never mentions or has long since forgotten: hope.